Frederick Sandys (1829–1904), Whitlingham, Norfolk (1860), oil on canvas, 25.7 x 76 cm, Yale Center for British Art, New Haven, CT. Wikimedia Commons. In the last article, I considered how early Pre-Raphaelite landscape paintings addressed the need to be true to nature, and its consequences. Although the PRB itself was short-lived, its style caught on and spread far beyond those original members. This article looks at those landscapes during the late 1850s. 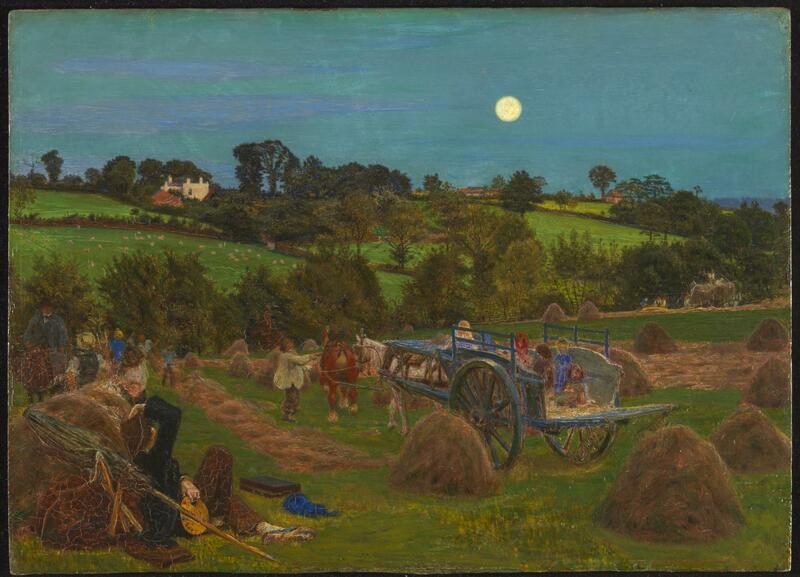 Ford Madox Brown persisted in his efforts to paint pure landscapes, in spite of earlier difficulties. After his ‘potboiler’ Carrying Corn, which he sold in June 1855, he was back out painting with the harvest on 28 July that year. It took him until late October to almost complete The Hayfield (1855-56), and even then he had to do some more work on the foreground and some other passages, which he did not finish until that Christmas. But it fetched more than three times as much as had Carrying Corn. Its foreground, though, is noticeably less detailed than in his earlier landscapes, and in parts this painting looks quite sketchy. The moonlight has not dulled its colour, and its look benefits from the unreal lighting effect. Ford Madox Brown (1821–1893), Walton-on-the-Naze (1860), oil on canvas, 31.7 x 41.9 cm, Birmingham Museum and Art Gallery, Birmingham, England. Wikimedia Commons. 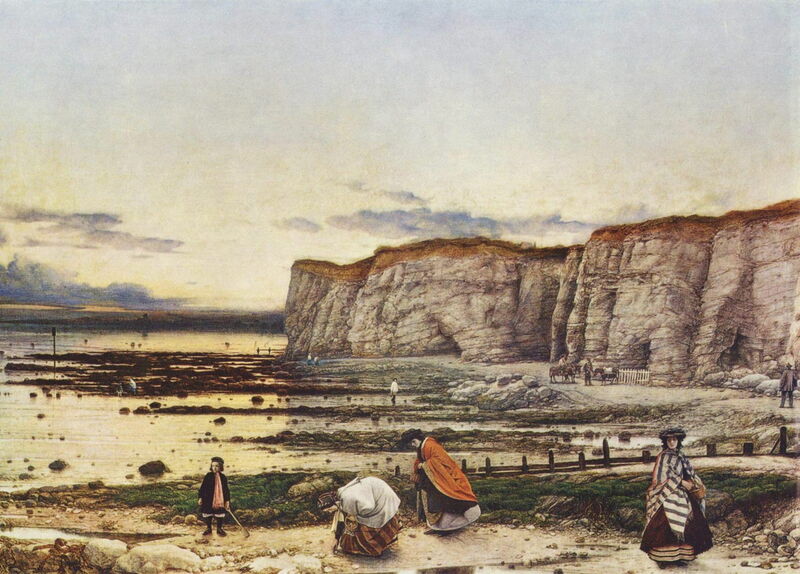 Brown’s next major landscape painting is that of Walton-on-the-Naze (1860). He is believed to have started this when he visited this coastal village in north-east Essex, England, in late August 1859, but cannot have worked long at it en plein air before returning home. It incorporates two unusual features: ephemeral lighting effects by way of the rainbow, rising full moon, and setting sun, and inclusion of the artist and his family as its main figures. With its flat landscape, distant detail, and complex lighting, it is a very ambitious composition for even a very experienced and adept landscape painter. Although Brown’s painting succeeds in the middle distance and beyond, his attempts at detail in the foreground are at best rather gauche, and at worst plain wrong: the foreground shadows are incorrect for the cut stooks, and absent altogether for the three figures. The following year, Brown was a founding member of Morris, Marshall, Faulkner and Company, and most of the rest of his career was devoted to design, rather than landscape painting. There were others who were close associates of the PRB who continued to paint Pre-Raphaelite landscapes, including Thomas Seddon, whose remarkable Léhon, from Mont Parnasse, Brittany I have already shown. 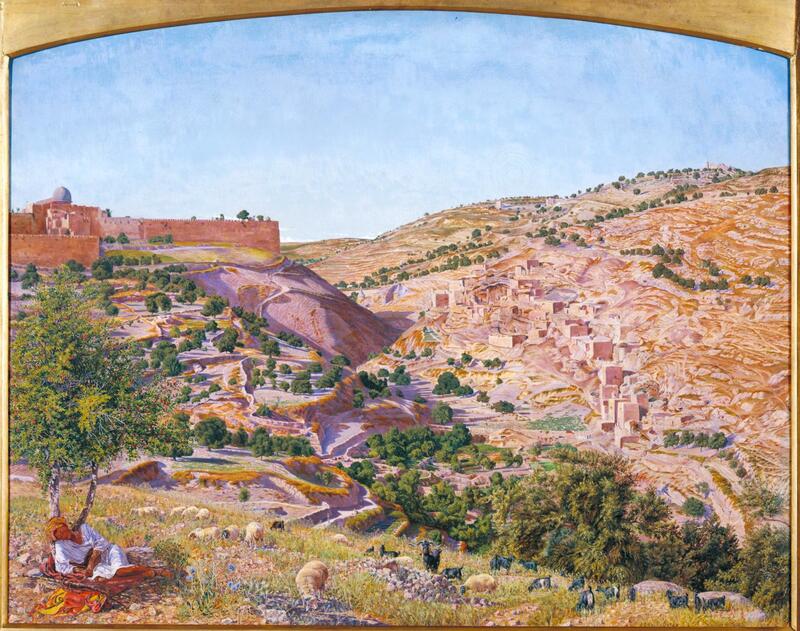 During a tour of the Middle East in the summer of 1854, he painted his most famous and impressive landscape of Jerusalem and the Valley of Jehoshaphat from the Hill of Evil Counsel (1854–5), which remains in accord with Pre-Raphaelite principles. He camped on a hill to the south of the city on 3 June 1854, and made this view from a point just a hundred metres up the slope from his tent. Although interrupted (unsurprisingly, given the conditions) by illness, he continued to work on this painting until his departure on 19 October. Once back in Dinan and then London, he used photographs and sketches to complete the work, which he did not exhibit until the autumn of 1855, more than a year after he had started on it. 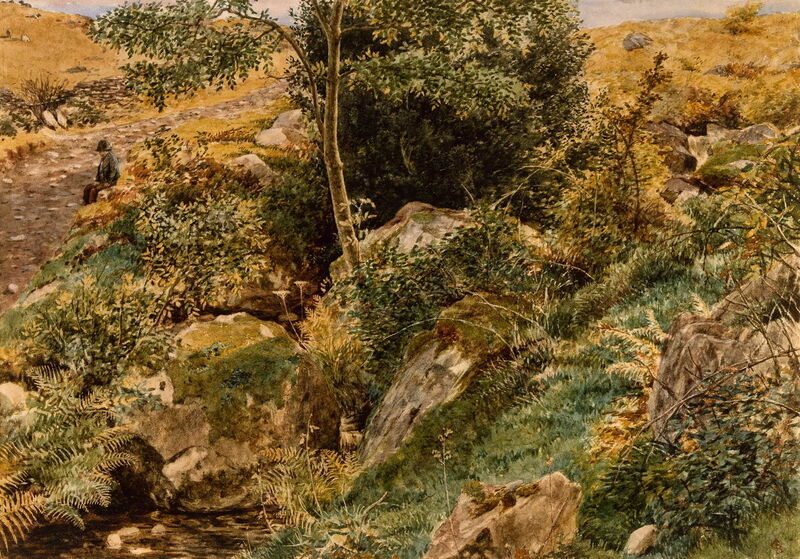 The painting is remarkable in its detail, but is a record of physical fact which looks more like a coloured drawing than other Pre-Raphaelite landscape paintings. William Dyce had not been close to the PRB itself, but painted some landscapes which illustrate an interesting progression. William Dyce (1806–1864), Culver Cliff, Isle of Wight (1847), watercolour, colored chalks and gouache over graphite, 17 x 26.2 cm, Metropolitan Museum of Art, New York, NY. Courtesy of Metropolitan Museum of Art. 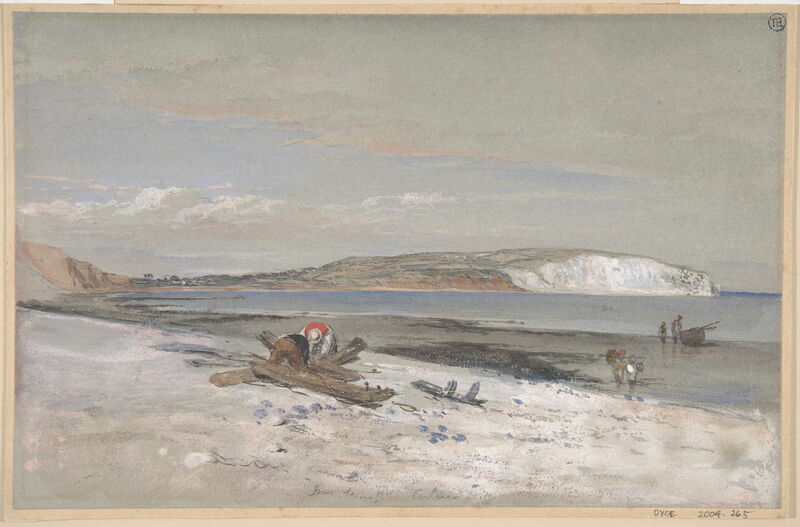 When he was on the Isle of Wight painting a fresco at Osborne House, Queen Victoria’s holiday palace there, he took a few hours off to paint this fine watercolour sketch of a similar view across Sandown Bay to Culver Cliff to that painted about three years later by Collinson and Burchett, but from low down on the beach at Shanklin. Then in 1858, after the PRB had effectively dissolved, Dyce visited Pegwell Bay on the coast of Kent for a family holiday. He followed that with his most famous painting, which has remained an enigma ever since. William Dyce (1806–1864), Pegwell Bay, Kent – a Recollection of October 5th 1858 (c 1858), oil on canvas, 635 cm x 889 cm, The Tate Gallery, London. Wikimedia Commons. The strata and fine texture of the chalk cliffs are rendered in the close detail specified by John Ruskin, and his colours are strong and clear, just as would be expected of a Pre-Raphaelite landscape. Whether this painting has any deeper meaning or reading remains an interesting issue, but it also conforms to what many would accept as Pre-Raphaelite style. 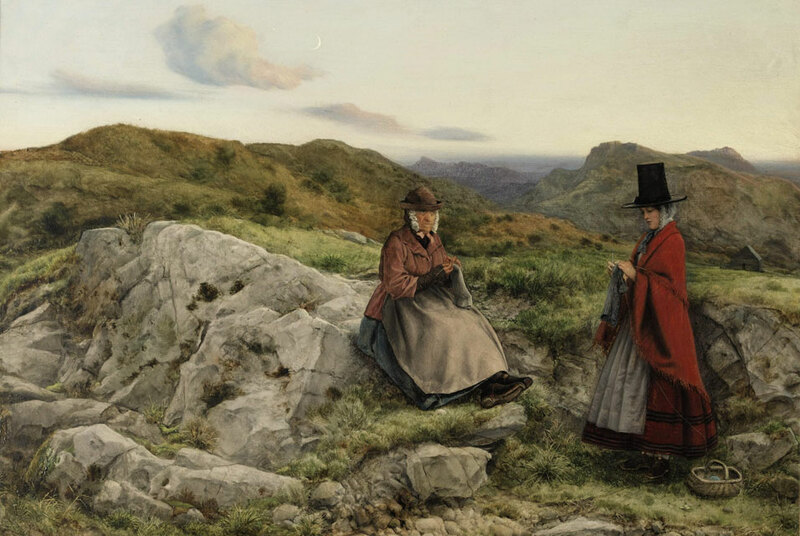 William Dyce (1806–1864), Welsh Landscape with Two Women Knitting (1860), oil on board, 36 x 58 cm, National Museum of Wales, Cardiff, Wales. Wikimedia Commons. In the autumn of 1860, Dyce stayed in the Conwy Valley, Wales, for six weeks, where he sketched and painted avidly. He then painted this finely-detailed and richly-coloured view on his return to London. Frederick Sandys was a close friend of Dante Gabriel Rossetti for a decade or so, until the pair fell out over Rossetti’s claim that Sandys had plagiarised his paintings. Primarily a draftsman, he painted a few landscapes in oils. 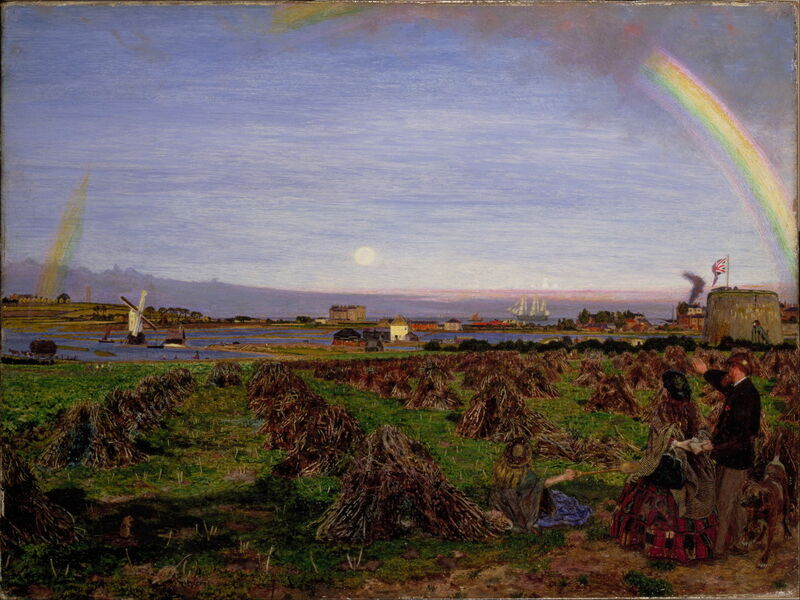 Whitlingham, Norfolk (1860) is probably his finest painting, and was completed while he was still close to Rossetti. It is also quite unlike anything that the latter ever painted, but would appear to be consistent with the principles of Pre-Raphaelite landscape painting. George Price Boyce was a friend of Thomas Seddon, who painted some landscapes in Pre-Raphaelite style. George Price Boyce (1826–1897), Autumn in the Welsh Hills (c 1860), watercolor on pencil, 26.7 × 38.7 cm, Denver Art Museum, Denver, CO. Wikimedia Commons. Autumn in the Welsh Hills (c 1860) is a finely-detailed Ruskinian watercolour, an example of that style, which he lost in the following few years. There were others, such as John William Inchbold, and Alfred William Hunt, whose paintings became Pre-Raphaelite for a few years, then moved on. But the most prolific and enduring Pre-Raphaelite landscape painter, John Brett, was then only just starting his career. My next two articles will look at his remarkable paintings. Barringer T (2012) Reading the Pre-Raphaelites, revised edn, Yale UP. ISBN 978 0 300 17733 6. Payne C (2010) John Brett: Pre-Raphaelite Landscape Painter, Yale UP. ISBN 978 0 300 16575 3. Prettejohn E (2000) The Art of the Pre-Raphaelites, Tate Publishing. ISBN 978 1 854 37726 5. Staley A (2001) The Pre-Raphaelite Landscape, 2nd edn, Yale UP. ISBN 978 0 300 08408 5. Note: PRB = Pre-Raphaelite Brotherhood, the core group within the much broader movement. Posted in General, Painting and tagged Boyce, Brown, Dyce, landscape, painting, plein air, PRB, Pre-Raphaelite, Ruskin, Sandys, Seddon. Bookmark the permalink. Why do I have to keep entering my keychain password in Sierra?